Favorites like the fried chicken and three-cheese pizza in one set, perfect for any party! 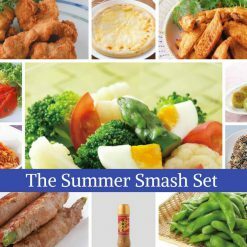 The Summer Smash set contains all the food you tried at the HealthyTOKYO event! This set contains a combination of dishes with half of them being vegetarian (V) friendly. Many prepared foods in Japan can contain up to 449 additives. However, Sugarlady food is all additive-free and natural so you can enjoy these foods without fear of consuming unknown additives that may harm your health. This collection of additive-free food contains favorites such as fried chicken and pizza smothered in three types of cheese as well as plant based options such as mixed vegetables and edamame! There are even unique dishes such as the round jade gyoza, which, unlike traditional gyoza has a translucent, flavor infused wrapper surrounding a juicy pork and chive mixture. If you’re looking for something naturally sweet, the cubed satsuma sweet potato with sesame is a crunchy, caramelized treat crusted with sesame seeds. 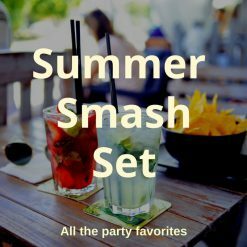 Recreate the party atmosphere with the Summer Smash set, or if you didn’t get a chance to go, try the additive-free food that was on offer!